Based on the novel of the same name by Leo Tolstoy, "Anna Karenina" abstractly comes to life in director Joe Wright's new film adaptation. First let me say I have seen all of Joe Wright's films and have read all of the novels that 3 of his 5 films are based. When Joe Wright first came on the scene in 2005 with his adaptation of Jane Austen's "Pride and Prejudice" I was less than enthused. I found his realistic style of downplaying the fantasy aspects of Jane Austen's characters and interior scenes exceptionally drab, but more than that IMO what makes most Jane Austen's works worth their weight in gold, is her feisty, clever, witty, and charming dialogues that give the possibly mundane or superficial lives of those characters a sense of great personality and adventure. Joe Wright had very little dialogue in his film; the lines he did have tend to bare little resemblance to those captivating moments as they appear in the novel or even in other film adaptations. With that being said, I still continued on with Joe Wright in 2007 with "Atonement". I had just finished Ian McEwan's novel right before seeing the World War II period romance and tragedy in the movie theater. Unlike my last experience with Wright, I felt he made the film equally as good as, if not better than the novel by not being too cheap on dialogue and really using all scenes, time, and camera angles to his advantage. The characters were in some cases colorful, but yet completely serious. And for parts of the film that did not have dialogue he found a way to also use montages and great landscapes bleeding into other landscapes and a way which things felt that they had come full circle in story that really they didn't. It was with this film I felt that Joe Wright had something or was willing to artistically explore how imagery can be used to say so much with out too many words, which invites the viewer to have a more personal indulgence with the characters. "The Soloist" perhaps is actually the weakest of Mr. Wright's films as I think the contemporary-city-style doesn't suit him stylistically, however the story was an interesting one. As for "Hanna", I again was able to fall in love with Joe Wright. He found a way to use fantasy and elements of Brother's Grimm to tell a contemporary, but strange science fiction and psychological thriller of a story about an extraordinary girl stuck in the middle of her father's severed ties to the CIA over the loss of his wife. Joe Wright takes us on an exhilarating adventure around the world, exposing us to the every day life of people who may not ever really know what might go on the world among the vibrant culture and classic stereotypes. As for "Anna Karenina" if your looking for a typical or standard of a period piece, this is not it. Joe Wright takes a que from Shakespeare as he theatrically and lyrically exposes Tolstoy's novel about late 1800's Russian class, infidelity, family, religious/political views, and social standing in a surprising and fresh way. Literally all the world is a stage when a whole theater is often used, as characters move through out, in, and around it. Scenes literally transform into other scenes, as set pieces move to the movements of actors, which is exceptionally well choreographed. There are things like flashing lights and small scaled trains that dance around the events of the characters, especially Anna. Kiera Knightly again continues to be Joe Wright's muse and for all the misgivings I had for her and Mr. Wright on "Pride and Prejudice", I can see the achievement of all of the films he has created combined here! It is the actors' facial expressions and poses along a beautiful score, physical movements, and the scenery that is really telling a complex love story about a women who was married to Wealthy Holy Ghost and her desire to feel something more than a general quit compassion in wake of knowing her own existence, -and the sad tragedy of choosing a different life and a different man, only to be mad and saddened with jealousy and never enduring stability for the sake of her own children. Although I agree this won't work with adapting all novels to film that rely on the dialogue for it's potency, like the works of Jane Austen, there surely are novels like Tolstoy's who's story and period more than spoken words between characters, and rather the written descriptions and the atmosphere of one's surroundings prove something of the likes of empiricalist David Hume, in which the experience of human identity might rely on a series of images in that an image can say a thousand words. 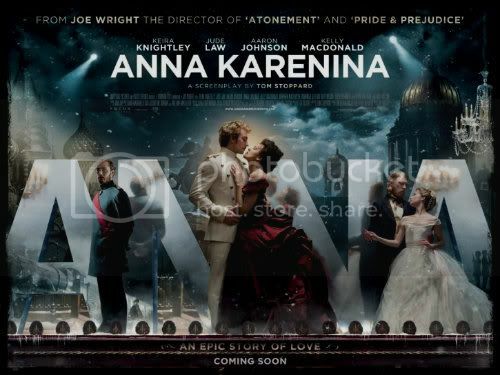 This is what Joe Wright has achieved with "Anna Karenina" and should considered an artistic masterpiece in it's cinematographic success! I heard many disliked this film but since I am a big fan of Joe Wright and many of the cast I watched it anyway. I thought the concept was beautifully done and agree a lot with what you have said. I could write pages and pages, but I'm going to stop myself from starting since I do have a paper to write. Glad someone else besides myself loved this film.